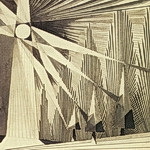 The illustrations that inspired jan-u-wine's poem for this entry have interesting histories. 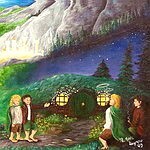 The first picture, a black and white drawing, was made specifically by Tolkien to illustrate The Hobbit, published in 1936. It is clearly titled "Mirkwood" on the bottom border and there is a large black spider. 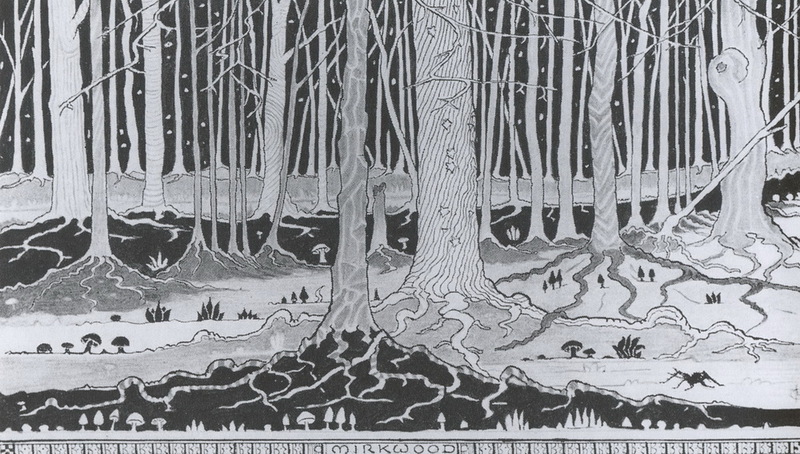 Tolkien wanted the drawing to appear as the book's front endpaper, but the publishers placed it in chapter 8, "Flies and Spiders", the one that takes place in Mirkwood. The forest, once Greenwood the Great, is shown as ranks and ranks of trees, both thick and slender, with extensive surface roots, the trees so high no leafy branches are visible. A jet black distance visible through the boles suggests either gloom or deep night. The style, clean, decorative and elegant, gives the impression of an eerie, silent, enchanted forest. It is not quite the brooding, dense, stifling Mirkwood of the book, but perhaps an aura of dark enchanted silence mattered more to Tolkien than one of a forest bearing down travelers, hemming them in, close and suffocating. There was an earlier picture, though, clearly the model for the black and white made for The Hobbit. In 1928, Tolkien painted a watercolour depicting the Taur-na-Fúin, the dark, evilly enchanted forest that sank beneath the waves at the end of the First Age. This picture was made to illustrate the Silmarillion tale of Túrin Turambar when the elf Beleg finds another elf, Flinding (later called Gwindor), recently escaped from Morgoth's fortress-dungeon Thangorodrim. 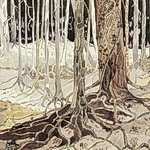 If you look closely at the left foreground you will see a small figure with long black hair, red pointed shoes and a sword hanging at his waist climbing over a sprawling tree root. That's Beleg. To the right at the base of the largest tree is the prostrate body of another elf, Flinding, his red cap and lantern beside him on the ground. It is a scene set in the Taur-na-fúin, yet the name at the bottom of the picture is "Fangorn Forest". How is that? In any event, both "Mirkwood" and "Taur-na-Fúin" aka "Fangorn Forest" are fine works, drawing in viewers and kindling imaginations just as good illustrations ought. for the turning of this Age. 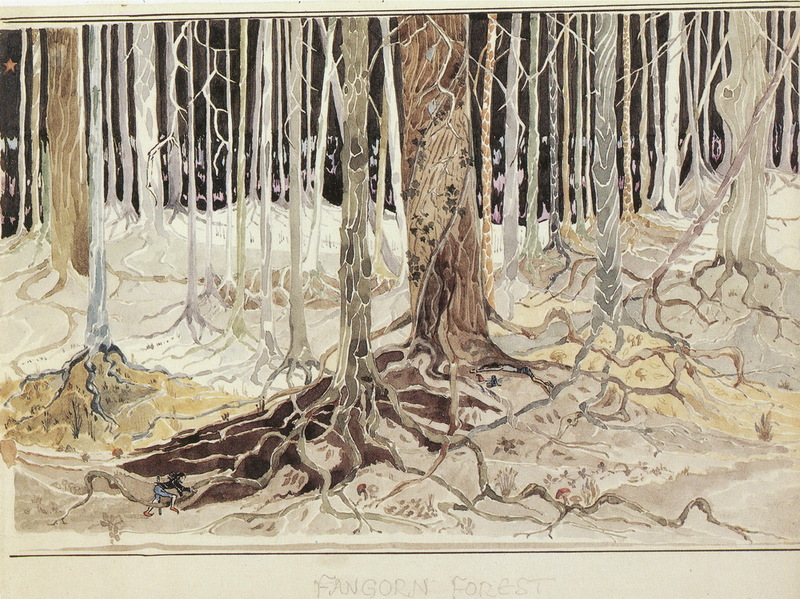 ~ "Beleg Finds Flinding in Taur-na-fúin", 1928, later titled "Fangorn Forest" by Tolkien for the 1974 Tolkien Calendar. 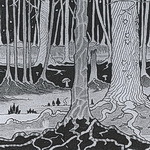 ~ "Moonlight on a Wood": picture by Tolkien, poem by jan-u-wine. I loved seeing and reading these. A great poem even if no Frodo around. :) or should that be :( - in any case, well done, my dear jan!